The dragon, a mythological creature that’s revered in Vietnam, symbolizes size and strength; in this area the watercourses are an important source of life, both for transporting merchandise of all types and for agriculture. For this reason the river is likened to a dragon. The Mekong Delta is located between Cambodia and Vietnam. The last part of the Mekong is located in southern Vietnam, where the local population lives closely tied to the river. Navigation along its entire length isn’t easy; in some sections it’s impossible due to currents, dams and water flow depending on the season. If you land in Vietnam, the closest international airport is the one in Ho Chi Minh City, from which you can take a bus. You can also get to Phnom Penh, the capital of Cambodia, via bus or the river by a cruise or any type of boat. Don’t expect crystal clear waters! Chau Doc is instead the crossing point between the borders of Cambodia and Vietnam. From here you can get on a boat or speedboat along the Mekong toward Phnom Penh. From Cambodia the river branches off to Vietnam and its mouth and delta with its nine estuaries – or dragons, as I said above. Note that you can also take a cruise leaving from Laos or Thailand (always through Phnom Penh). If you decide to travel through various countries, first make sure that you have all necessary visas (or know how to get them along the way). If you’re a fan of history and want to increase your knowledge, I recommend the city of Vinh Long, which offers museums about the war in Vietnam and also a few interesting temples. Day 3: The last day, you can continue your tour on the Mekong among green oases and villages before heading toward the north of the country or return to Ho Chi Minh City. You can also opt for a half day visit. What’s there to see along the Mekong Delta? Along the Mekong Delta you’ll have a unique experience among green oases and villages, excursions to discover the people that live along the banks of the river and subsist on fishing or floating agriculture, junks, pagodas and sampans – the typical wooden boats – that go back and forth and constitute the most frequent form of transport and communication. The Mekong Delta is the area in southeast Asia where you can more fully enjoy this wonderful tradition directed toward nature. 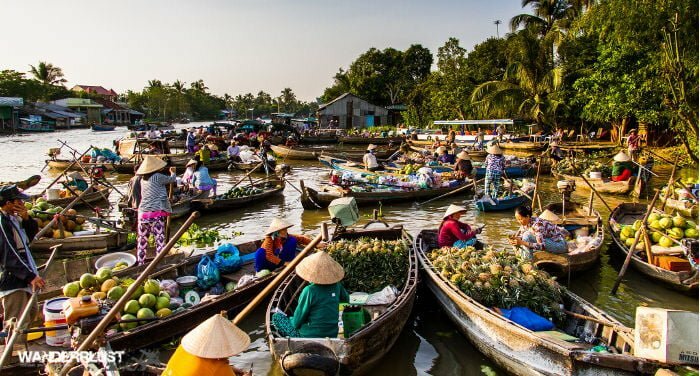 There are in fact countless boats that you’ll come across, along with products and the people that live there, who besides navigating the river for commercial purposes, have made their floating market their reason for living. Since you’re in this part of Vietnam, I recommend that you also go visit the Cu Chi Tunnels: this is a network of tunnels and underground alleys that were able to host up to 10,000 soldiers, where during the war against the Americans, Vietnamese soldiers hid and took refuge to rearm and surprise American troops. Unfortunately, the refuge was discovered and bombed, but since then it was restored. Here you can directly immerse yourself in the 60’s through galleries that were 80 centimeters wide, 1.2 meters high, and about 220 kilometers long. Besides cultivating rice, you can see plantations of rubber, juta, cotton, tabacco, coffee, pepper, coconut palms and sugar palms. Where to stay on the Mekong Delta? If you decide to take a long cruise, you can sleep on board or in one of the villages mentioned: there are lots of families ready to host you and give you their heart and soul. If you’ve seen Apocalypse Now, the film directed by Francis Ford Coppola in 1971 about the Vietnam War, you’ll certainly remember the scenes where Captain Benjamin Willard (Martin Sheen) goes back to the Nung River, on his search mission for Colonel Kurtz (Marlon Brando). Although it was filmed in the Philippines, that river was in reference to the Mekong.